Can Lisa predict my future? Lisa does not predict your future and would rather teach you how to tap into and listen to your own inner guidance which you can use each and every day as you make your choices for your future. 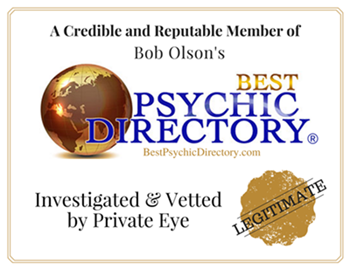 If you are looking for someone to predict your future, you need to seek out a reputable psychic and go into the psychic reading knowing that, at any moment, your future can and will shift depending upon the choices and decisions you make at any moment or on any day. Can my loved ones who have crossed over predict my future? Your loved ones can offer love, support, and sometimes guidance, (they may see you heading for trouble and will try to help), but it is up to you to create your future. Lisa is often guided by your loved ones, her Higher Self and her own guides to speak to you about your situation and offer resources, tools and encouragement but it is your free will that will decide your own future. Can Lisa read me? No. Lisa does not do psychic readings. Lisa uses different psychic abilities to specifically connect to Spirit and receive communication from those who have crossed over to the Other Side. While she does need to connect with your energy to make a stronger, clearer connection to your loved ones, she doesn’t read you. An easy way to remember the difference: psychics perceive information about/from you; mediums receive information from Spirit. Can Lisa locate missing people? Presently, Lisa does not do this type of work. Can Lisa communicate with pets here and on the Other Side? While Lisa loves animals, her psychic and mediumship abilities do not include animal communication at this time. She may, however, connect with your beloved pets through your loved ones who have crossed over. Often your loved ones will bring forth pets to let you know they are safe and sound with them on the Other Side. At that point, Lisa will get a sense of your pets’ size, color and sometimes even personality rather than be in direct communication with them. Does Lisa offer probono sessions? Lisa has done an enormous amount of probono work throughout the years. And, for three years, she offered free mini-mediumship readings on her radio show, Messages From The Other Side on BlogTalkRadio. As of January 1, 2019, she will be hosting private, Patron-only call-in shows offering free job/life coaching and/or mini-mediumship readings. How do I record my call? If you would like to record your call with Lisa, you can use a free software program like Audacity, or, if you use Skype audio, you can record the call using that. If you would like to schedule a mediumship reading with Lisa, please visit her Schedule a Reading page. Copyright 2013-2019 – All rights reserved.